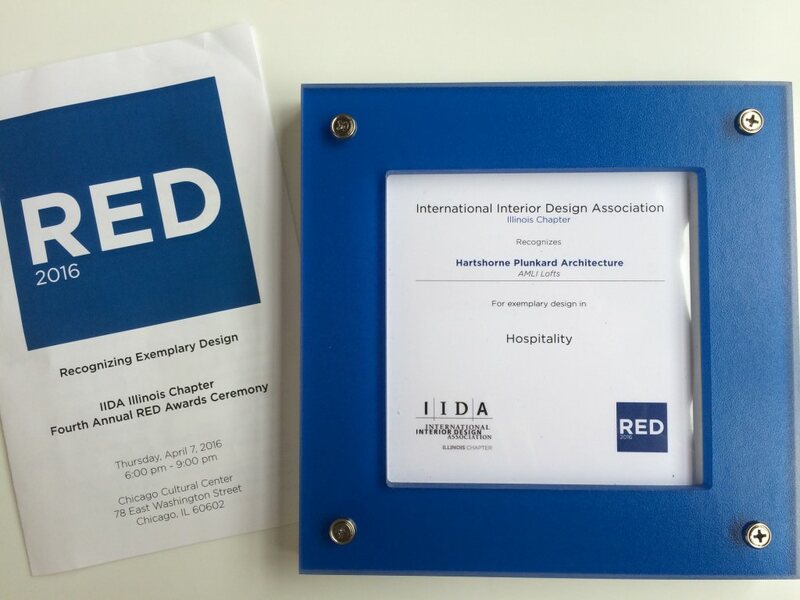 Hartshorne Plunkard Architecture received the RED Award for Hospitality Design from the Illinois chapter of the International Interior Design Association (IIDA). The RED (Recognizing Exemplary Design) award competition recognizes the best interior design projects from the Illinois community. The sold-out awards ceremony was held on April 7 at the Chicago Cultural Center, and attended by hundreds of design professionals who celebrated the winners during the awards presentations and cocktail reception. Aracely Nevarez, Jessica Leo, Ruba Nemer and Jeffrey Wigen accepted the award on behalf of the HPA’s Interiors Group. HPA was previously recognized by the Illinois Chapter of the American Society of Interior Designers (ASID) with a Design Excellence Award in Hospitality for the same project. AMLI Lofts is a lifestyle apartment development in Chicago’s South Loop that features exposed finishes, luxurious textures and patterns, and custom furniture that complements the building’s loft aesthetic.